Which organism and reference genome? 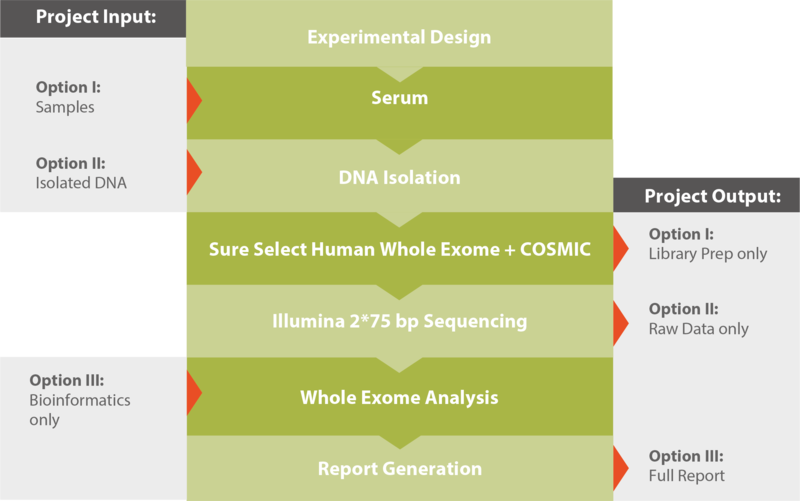 A typical workflow for a whole exome sequencing project is shown in the graphic below. Please note that our highly-modular processes allow you various entry and opting out options. If you outsource your entire NGS project to Microsynth or only parts of it is up to you. For further reading and a detailed technical description, please download our Application Note Illumina Whole Exome Sequencing (see related downloads). The results produced by our analysis module help answer two main questions of a resequencing of a eukaryotic exome aiming at detecting variations to a pre-annotated reference exome. Table 1: This is a cutout of the full table detailing read coverage for every target in the sequenced exome. Table 2A: This detail of a results table shows the detected variations and their annotation. Table 2B: This detail of a results table shows the detected variations and their effect on the respective protein sequence. Table 3: This detail of a results table shows detected variations that are also listed in public databases such as ClinVar - NCBI - NIH. Detailed information on our whole exome sequencing service.